Grave Forsaken is a Christian thrash metal band from Perth, Western Australia. Forming in 2004, then band has now released 6 studio albums. Grave Forsaken have become a recognised name in the underground Christian metal scene and continue to deliver new music on a regular basis. The band consists of Vaughan Gregory, Elias Salmela, Matt Skipworth and Luke Gallagher. Vaughan is vocalist and Matt handles bass guitar. Elias and Luke share rhythm and lead guitar duties. Josh Gallagher produces the band and guests on drums. Vaughan, Elias and Matt have been in the band since the beginning, while Luke came on board in 2011. Josh has been involved with the band since 2013. The band released “Beside The River of Blood” in 2006, “Destined For Ascension” in 2008, “This Day Forth” in 2009, “Fight To The Death” in 2010 and “Reap What You Sow” in 2012. Each successive album has seen the band hone their thrash sound, culminating in the latest effort “The Fight Goes On” in 2015. Grave Forsaken is also known for their tight and entertaining live shows. As well as regular performances in Perth, Grave Forsaken has played shows all around Australia. The band has also had several supports for the legendary Christian metal band Mortification. 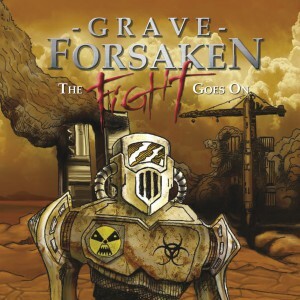 Grave Forsaken have always been about getting on with it and not giving up. The band has plans for more shows in 2016 to support the latest album and look forward to seeing you out there!